Over the years, the Teaching Development Grant (TDG) and the Language Enhancement Grant (LEG) have been supporting many successful projects/initiatives, with their findings and deliverables widely disseminated and adopted in the UGC sector. This Symposium seeks to showcase the good work of our colleagues who have benefited from the teaching and learning related funds from the UGC, amidst facilitating discussion on innovative pedagogies and collaboration between teaching development and language enhancement. We are honoured to have invited, Professor David Gibson (https://clt.curtin.edu.au/global/dir_learning_futures.cfm/David.C.Gibson), UNESCO Chair of Data Science in Higher Education Learning and Teaching and the Director of Learning Futures at Curtin University, to be our keynote speaker. Professor Gibson will share his experience and findings of studies in game-based learning based on big data analytics. 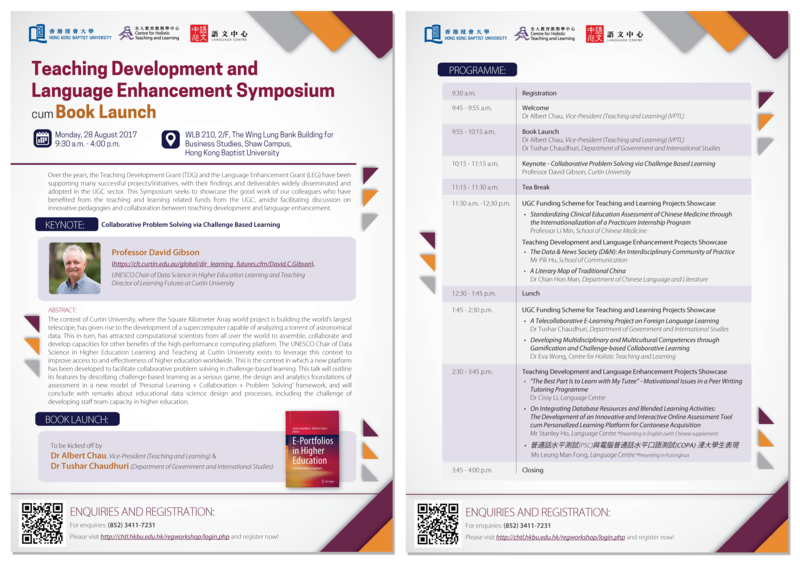 Dr Albert Chau, our Vice-President (Teaching and Learning), will kick off the Symposium with a welcome address underscoring the importance of quality teaching and learning, followed by a book launch for “E-Portfolios in Higher Education”. Our colleagues with projects supported by the TDG or the LEG will also highlight various pertinent teaching and learning issues and pedagogical practices.